Pantry’s come in all shapes and sizes from a small over-stuffed cabinet to a large walk-in closet. One thing is certain, if you have one you will fill it or more likely over fill it. If you don’t have one, you desperately need one. A pantry can fit into a surprising amount of spaces that you may not have thought possible. 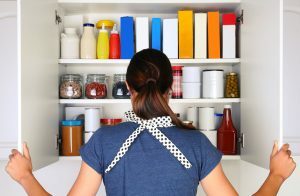 But once you have taken the step and added the pantry to your kitchen, or enlarged your existing one, you will wonder how you survived so long without it.A well-organized pantry brings order to your kitchen. It allows you to quickly locate the needed ingredients to create your family meals and let you get on with your life without spending undue time pointlessly searching for buried ingredients that may or may not be hiding behind other ingredients in an overcrowded, over-cluttered too small pantry or cabinet. An organized pantry will additionally keep clutter off of your counters. Evaluate your existing kitchen space and determine if there is any additional space that can be converted into a pantry. Remember there are several different types of pantry’s: closet, roll-out, flat-cabinet, etc. You may be able to create a pantry out of a space where nothing currently exists. For example, the unused space beside the refrigerator and the corner. The point is the space for your pantry may not be immediately obvious. The available space will determine what type of pantry you will be able to build. For example if you only have a very narrow space and roll-out pantry will most likely be your best option. However, if you have a long open wall, but not a lot of depth to work with, you will probably want to go with a flat pantry with sliding doors. If all of this is sounding a bit overwhelming to you, then call your local Andy onCall® professional to help you navigate your way to the right solution for your home and your lifestyle. When you are looking for better-to-perfect ideas to organize your kitchen space, Andy onCall® has you covered. Start your organizing decisions by making a checklist of what you need and what works for you and your kitchen space. Then your Andy onCall® Craftsmen will evaluate your space and your needs and come up with a solution that will work for you. So with the holidays rapidly approaching, give yourself the gift of an organized kitchen and make the holiday cooking a breeze.